Reliance Quant Fund aims to deliver “true alpha” by using a scientific model based investment approach that focuses on the “sweet spot” confluence between growth, momentum and value investing styles. Ashutosh shares back tested data for his model which seems quite encouraging in an environment where large cap alpha is increasingly becoming a challenge. Its smart beta positioning enables the product to be offered at a lower cost relative to actively managed strategies – a welcome move especially in the large caps space. WF: Your fund aims to participate in the “sweet spot” that sits at the confluence of growth, value and momentum styles of investing. Can you please elaborate how this will be done? Each of these strategies/ factors can potentially outperform the markets, however, no one strategy / factor works all the time. We believe a combination of these investment styles can create potential Alpha across all types of market conditions. Quant funds attempt to generate Alpha or excess return over benchmark by adopting a scientific model based investment approach. This fund selects stocks/securities using a combination of various investment factors with a view to generate potentially superior returns across market phases. In Reliance Quant Fund, we attempt to select securities based on a scientific Quantitative model that uses a combination of Styles. The model uses a combination of improving fundamentals, acceptable valuations and favorable momentum shortlists about 30 stocks, which as a portfolio, has the potential to outperform the market under all kinds of market conditions. WF: Do you have weights assigned to each style? How will this be dynamically managed to reflect changing market dynamics? What are the quantitative measures that will guide stock selection and what is the rationale for choosing these? Ashutosh: After extensive research and back-testing, we have chosen 8 quantitative parameters from across Fundamentals, Value and Momentum. We have assigned approximately 50% weight to Quality / Fundamentals, because evidence suggested that stocks were largely driven by quality such as the earnings growth, and sustainability of the same, about one-third (33%) weight to Momentum indicators and another 17% for Value indicators. We do not intend to dynamically change the variables, unless over time, there is a strong merit to reconsider the weights or the metrics considered within them. We are fairly confident that the quantitative parameters we have chosen are robust, and have the capability to identify stocks, and hence help us construct the portfolio, which could generate sustained alpha. WF: Your fund relies on the hypothesis that “evidence” based portfolio construction works better than opinion based models. Do we have evidence to back this hypothesis? How does back testing of your model stack up vs traditional active investing oriented funds? 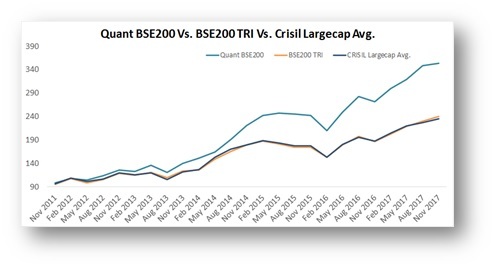 The Fund has also outperformed CRISIL Large Cap Average. Rs. 100 invested in the strategy has become Rs. 340 vs Rs. 220 of the large cap funds (data till Dec 2017, since the Crisil Large Cap index data is available only till then). Reliance Quant Fund would be positioned against the actively managed large cap funds, with an attempt to outperform them on a sustained basis over the period. WF: What elements of alpha generation are attempted to be captured in this smart beta product? WF: What are the key risk management practices that have been inducted in this quantitative model? 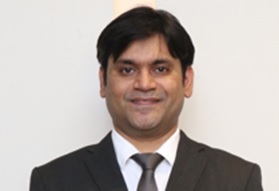 Ashutosh: Reliance Quant Fund follows a defined approach for investments, which goes a long way in controlling risks, while attempting to generate sustained alpha. Unbiased, Systematic investment approach: The fund will adopt a systematic investment approach which is completely objective and unbiased or free from emotional bias. Evidence based investing: Quantitative model based on trailing disclosed information, thus avoiding any predictive analysis or forecasting. Rebalancing done once every Quarter, based on quantitative evidence. Defined Investment Universe: The fund will endeavor to select 30 stocks within the S&P BSE 200 index universe. Large Cap Orientation: Investments pre-dominantly in top 100 companies (within the S&P BSE 200) with a view to have higher large cap exposure and relatively lower volatility. Low Concentration and Deviation risk: Investments in a single stock will not usually exceed 8% of the portfolio at the time of investing and the fund will have no significant sector deviation as compared to the benchmark sector weight. 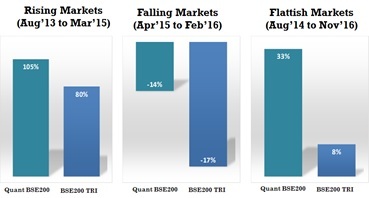 Hence the portfolio volatility will be potentially lower. WF: Given its smart beta positioning, how does the expense ratio compare with actively managed equity funds? Ashutosh: The positioning of the Fund is somewhere between passive funds like ETFs / Index Funds and actively managed diversified equity funds. While ETFs / Index Funds are designed to generate index-minus returns (Index returns minus expenses), the endeavor in such smart beta products is to generate better returns than the index (or markets), without ‘actively’ managing the funds. Given the nature and positioning of the fund, we are keeping expenses moderate. The Regular Plan expenses would be <1%. WF: How do you see the road ahead for smart beta offerings in India? World-over, smart beta products are extremely popular. They are almost as popular as ETFS / index funds and actively managed funds, commanding nearly one-third of the total assets. As markets mature, as may be the case with Indian markets already, generating alpha would become increasingly challenging. Funds like Reliance Quant Fund, which attempt to generate ‘True Alpha’ within a well-defined contour would find a lot of takers.